While a majority of the countries of the world use a solar calendar, establishing the length of a year based upon the Earth’s rotation around the sun, some countries and groups use a lunar calendar. This means that one month is complete with a full cycle of the moon, from new moon to new moon. The lunar calendar year consists of twelve months, just like the solar calendar, yet each month is slightly shorter. Rather than the average month lasting more than 30 days such as in the solar calendar, each month in the lunar calendar is approximately 29.5 days. Though the lunar calendar is just as legitimate as a timekeeper as the solar calendar, because most of the world uses the solar calendar, those who use the lunar calendar often compensate by adding an extra month every few years to stay with the rest of society. Those who use a form of the lunar calendar include Islamic states, Israel, China, and many Wiccans as well. These Wiccan sects that use the lunar calendar do so for reasons that transcend a basic timekeeping purpose. In the faith, the moon is often attributed to Goddess, and thus plays a very important role. While the sun is a constant, remaining in the same place in the celestial sphere, the moon is constantly changing like humanity and like the seasons. The moon is a major subject in pagan and neopagan folklore, often personified as the Goddess. Most Wiccans hold that the changing lunar phase is significant to our growth and our understanding of the Universe. For example, the new moon is the best time to begin an endeavor, whatever it may be. Then, as our perception of the moon grows larger, or waxes, so does our potential. It continues to grow until the moon becomes full, at which time it is important to reflect upon what we have done in this period of growth, and try to learn from it. Our perception of the moon then goes into decline, or wanes, as we use this time to embrace our Spirituality and prepare for the initiation of a new endeavor. Many Wiccan Rituals are associated with these lunar phases. 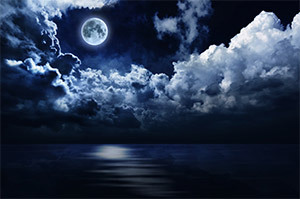 Many Wiccan sects have taken this idea even further, and based off of folklore and mere observations, have given the moon a distinct personality based upon the month of the lunar calendar. As opposed to lunar phases, these are called seasonal moons. The month of January in the solar calendar is referred to as the Wolf Moon in the Wiccan lunar calendar. This is deemed to be a time to gather your strength, and prepare yourself for what may come in the coming year. February is called the Storm Moon. In this lunar cycle, many face bleakness and other hardships, but should rather be considered challenges to overcome and learn from. March is the Chaste Moon. The seasons begin to change, and the land becomes fertile. It is a time for mental preparation and focus. April is called the Seed Moon. This is because the seeds of life are planted during this time, and growth is to be expected. May is the Hare Moon. Though scholars disagree as to the origins of hare, it is considered to be a time to gain wisdom, find love, and to let your personal energy flow wild. June is called the Lover’s, or Dyad Moon. Beauty and abundance are at their peak, and it is okay to indulge, and to enjoy what life has to offer. July is called the Mead Moon. This is the best time to enjoy the fruits of your hard work, and physical and mental preparation. August is the Wyrt Moon. It is the best time to collect what you have grown, as well as your thoughts, and find a safe place to keep them so that you may retain them. September is called the Barley Moon, October the Blood Moon, and November the Snow Moon. This is a significant stretch of transition, in which you may encounter both good and bad, but are often tested to use what you have learned in the previous months in order to apply it to new situations. December is the Oak Moon. The year has come to an end, and perhaps it has been a good year, perhaps it has not. Regardless, it is a time to heal yourself, and to find hope for the coming year, when it starts all over again. Did you have a chance to catch the New Moon yesterday with the partial Solar Eclipse? 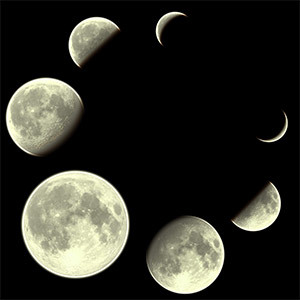 Which moon phase is your favorite time to cast your own spells. 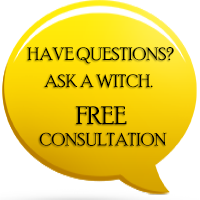 As always, we love to hear from you, if you would like to add a comment, you can use the form below or join the conversation on our Facebook Page.